By Tim Royner: A fight on PBC headlined between former world champion Devon Alexander and Andre Berto, light heavyweight contender Marcus Browne and Lenin Castillo, and former middleweight champion middleweight Peter “Kid Chocolate” Quillin vs. J’Leon Love is being finalized for August 4, according to Dan Rafael. The card will be taking place at the Nassau Coliseum in Long Island, New York. This is a Premier Boxing Champions card. The Alexander vs. Berto fight is one that would have been a great one had it taken place in 2009 or 2010, when both fighters were still in their prime. It would have been a great fight if it had taken place back then. Unfortunately, too many years have gone by and both of their careers have tanked to the point where they’re not in the same ballpark of where they previously were at. The 31-year-old Alexander didn’t look that bad in fighting to a 12 round draw against Victor Ortiz last February, but he still needed to be a lot better than that for him to be considered one of the top welterweights in the division. Ortiz is the type of guys that fighters need to be able to beat for them to be considered an elite level fighter. It wasn’t a good thing seeing Alexander struggle against the 31-year-old Ortiz in their fight in El Paso, Texas. Berto, 33, lost his last fight to Shawn Porter by a 9th round knockout last April in Brooklyn, New York. Berto was cut from head-butts, and not ready for the aggressiveness of Porter. I don’t think Berto realized how aggressive Porter would be in that fight because he never seemed comfortable for a moment. 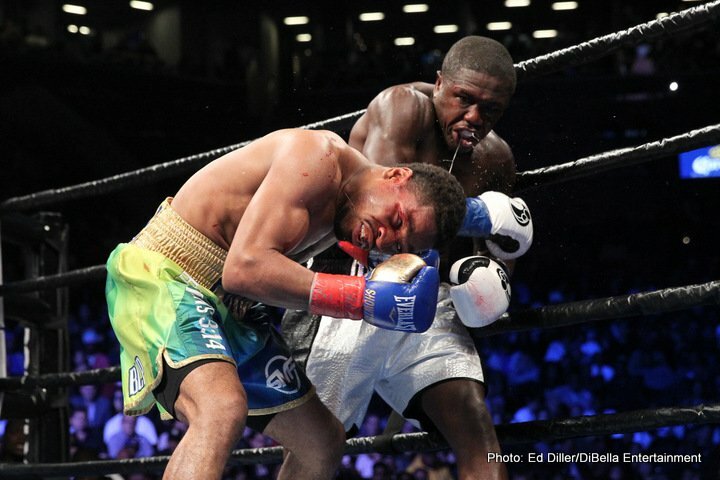 The fight was finally stopped in the 9th after Berto was knocked down twice by Porter. Berto was also dropped in the 2nd round. Originally the Alexander vs. Berto fight was going to take place on July 28 on the undercard of the lightweight unification fight between WBC 135 lb. champion Mikey Garcia and IBF champion Robert Easter Jr. The Alexander vs. Berto was moved to August 4. The fight between welterweights Victor Ortiz and Brandon Rios will now be moved off the August 4th card, according to Rafael. Unbeaten light heavyweight contender Marcus Browne (21-0, 16 KOs) will be facing Lenin Castillo (18-1-1, 13 KOs). This is a good match-up. 2012 U.S Olympian Browne has looked good in his last three fights in stopping Francy Nieu, Sean Monaghan and Thomas Williams Jr. Browne, 27, was recently in the running for a title shot against WBO light heavyweight champion Sergey ‘Krusher’ Kovalev, but instead the Russian fighter went with Eleider Alvarez. Browne as looked a lot better since his controversial eight round split decision win over Radivoje Kalajdzic. Browne was knocked down by Kalajdzic in the 6th round and dominated in the last three rounds. The fight arguably should have been scored for Kalajdzic. The 29-year-old Castillo has won his last three fights after losing to Joseph Williams by an 8 round majority decision last year in February 2017. Castillo fought to an eight round draw against Travis Peterkin in August 2015. In Castillo’s last three fights, he’s beaten Aaron Mitchell, Andy Perez and Eduardo Mercedes. Also on the card is former WBO middleweight champion Peter ‘Kid Chocolate’ Quillin (33-1-1, 23 KOs) making a rare appearance in facing #6 IBF J’Leon Love (24-1-1, 13 KOs) in a fight at super middleweight. The fight will be televised on PBC. Quillin, 35, is making his first appearance in 2018 after fighting just once in 2017 and not at all in 2016. Quillin’s once successful boxing career has stalled out after he vacated his WBO 160lb title in September 2014 and then sat out of the ring for an entire year before coming back in 2015 to defeat Michael Zerafa by a 5th round knockout. Quillin was then stopped in the 1st round by Daniel Jacobs in December 2015. In another bizarre move, Quillin didn’t fight at all in 2016 before coming back last year to defeat journeyman Dashon Johnson by an eight round unanimous decision in September 2017. Quillin moved up in weight to super middleweight. He’s always had the size to fight at super middleweight, but he instead would boil down to 160 to enjoy a size advantage over the middleweights. At 168, it’s unclear how much success Quillin is capable of having in the super middleweight division. Quillin’s age and his frequent inactivity suggests that he’s not going to be able to accomplish much at super middleweight. Fighting once a year isn’t going to work for Quillin because there are too many talented fighters in the super middleweight division that are much younger and far more active than him. Love, 30, has won six out of his last seven fights since being stopped by the hard hitting Rogelio ‘Porky’ Medina in the 3rd round in 2014. Love has turned things around in beating Dashon Johnson, Jaime Barboza, Marcus Upshaw, Michael Gbenga, Jason Escalera and Scott Sigmon. Last year, Love fought to an eight round draw against Abraham Han.